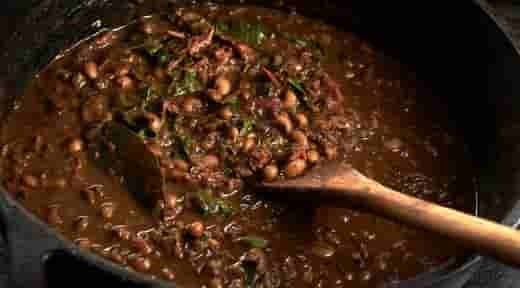 Great for New Years, this blackeye pea gumbo with pork and collards makes a great meal! It's a great comfort food for cold nights too. Add oil or bacon fat to a large Dutch oven, preferably cast iron, over medium heat. Make a roux by adding flour and stirring constantly for 30 minutes to 1 hour. Just before it’s dark brown, add the next four ingredients and sauté 5 minutes. The roux will continue to darken, and the vegetables will caramelize. Add stock to roux mixture. Simmer for an hour, stirring often. Skim any fat off the top. If too thick, add more stock. While stock is simmering, fry bacon in a skillet until crisp. Remove bacon and drain on paper towels, leaving bacon drippings in skillet. Add collard greens and chopped onion to bacon drippings in skillet, and sauté until wilted. Crumble bacon and combine it with cooked greens/onion mixture. To Dutch oven, add vinegar, sugar, hot sauce, and salt and pepper to taste. Then add greens mixture, blackeye peas, pork, thyme, bay leaves, filé powder, and Creole seasoning to taste. Return to a simmer and adjust seasonings to taste. Serve over hot cooked rice with French bread.